What an item! Great color and layout with copy that is unusual to say the least. 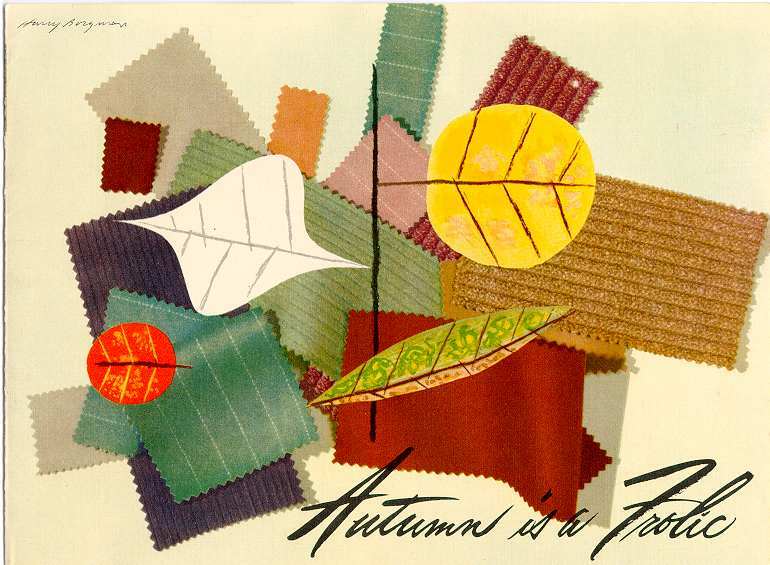 This folder measures approximately 10 by 7 1/2 inches and the cover art, which shows upholstery fabrics insterspersed with leaves of autumn, is signed by Harry Borgman. Would this copy make you want a Manhattan? Yes, autumn days are golden days filling you with a new zest for living, a yearning to make the most of each glorious day and a desire to possess the best life has to offer. In your magnificent Frazer you are scaling the heights as you take flight down the color-splashed open road riding in the lap of luxury on wide air foam cushion seats. 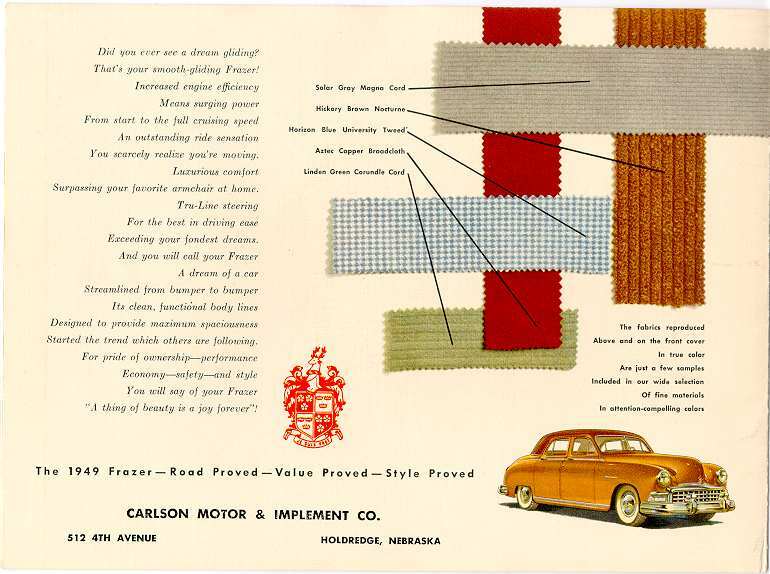 You marvel at the exquisite beauty of your car's interior every minute detail as carefully designed as fine jewelry and its brillant harmonizing exterior in tune with Nature's stepped-up color scheme. You are filled with contentment at its magic-touch performance. Your friends stop and stare admiring your impeccable taste. One golden day follows another in your Frazer--your most priceless possession. This is a hard-to-find item that is frequently missing from collections. Additional copy and a watercolor illustration of a Frazer cruising down a tree-lined country lane with a small dog leading the way are revealed when the folder is opened. A larger view of the front cover is available (59K jpeg). The rear cover (58K jpeg) is also quite striking in appearance.